Store Mor Equipment can save you money by helping you optimize the productivity of your space. Let us help you with your commercial shelving layout. We have experience with commercial, industrial, warehouse, pharmaceutical, foodservice and healthcare shelving designs. Metal clip style shelving is easy to install and has quick and easy shelf adjustment. Ideal for any application office, home or warehouse. This type of shelving uses sway braces for stability of the unit. It allows for open access to your product. The closed metal clip shelving has sheet metal panels on the sides and backs. This increases stability and provides a cleaner more finished look. Metal clip shelving units with bins combines shelving with storage bins allowing you more versatility when storing small parts and components. Rivet Style shelving is designed to provide an economical solution for storage. Rivet shelving offers spans of up to 8 feet wide and depths of up to 4 feet. Capacities can run over 2,000 pounds per level. Rivet type shelving is available with a variety of decking materials depending on the application The decking options include wood, wire and steel. Chrome, Epoxy or stainless steel finishes are available on wire shelving to match your need. Strong wire construction permits air circulation, sprinkler penetration and reduces the accumulation of dirt and dust. Need extra space but dreading the office manager’s frowns and employees whining because of the noise and mess? Just contact us to review Modular Office advantages. No dust with quick installation. Are you in a leased space or have a need to add people in a year or so? 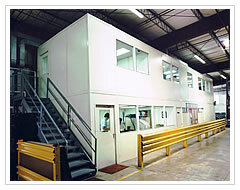 In-plant offices with their modular construction can be taken down, added to, etc. Contact us to see existing in-plant offices that have solved other client’s challenges.